John S. Steinberg, DPM FACFAS, is the Co-Director of the Center for Wound Healing at MedStar Georgetown and is the Director of the Podiatric Residency Training Program at MedStar Washington. 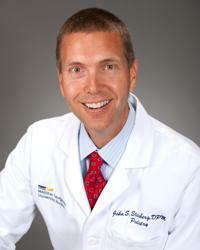 Dr. Steinberg is a professor in the Department of Plastic Surgery at Georgetown University School of Medicine. He is board certified by the American Board of Podiatric Surgery in foot surgery and in reconstructive rearfoot and ankle surgery. Dr. Steinberg completed a three-year surgical residency at the Inova Fairfax Podiatric Residency Program and then completed a one-year Diabetic Foot/Limb Salvage Fellowship with the University of Texas at San Antonio. In addition to general foot and ankle care, a large portion of Dr. Steinberg's practice is devoted to non-healing wounds and surgical care of the patient with diabetic foot complications. His wound care team takes a progressive, often surgically based approach that helps to speed healing and avoid amputation. Dr. Steinberg comes from a family of podiatrists. He takes great pride in his specialty and his unique contributions to the field. Dr. Steinberg works with a multi-disciplinary team that includes plastic surgeons, vascular surgeons and infectious disease specialists. Dr. Steinberg stresses the importance of including the patient's family in decisions made and communicating thoroughly with all who are involved. Dr. Steinberg has earned numerous honors and awards, including the Teaching Faculty of the Year at MedStar Washington in 2012 and the Lifetime Achievement Award from Podiatry Management magazine in 2013. He has lectured extensively on diabetic limb salvage and is involved in clinical research and publication. BLOG What Are the Warning Signs of Diabetic Limb Damage?